Heat oven to 350°F. Line 2 cookie sheets with cooking parchment paper. In medium bowl, knead cookie dough and flour until combined. On floured surface, roll dough to 1/8-inch thickness. With 11/4-inch star-shaped cookie cutter, cut out 5 stars. With flower-shaped cookie cutters in 5 different sizes (3 1/2, 3 1/4, 2 3/4, 2 1/4 and 1 1/2 inch), cut 25 cookies, 5 of each size. Place stars and smaller flowers 1 inch apart on one cookie sheet. Place larger flowers 2 inches apart on second cookie sheet. Bake smaller cookies 6 to 8 minutes, larger cookies 8 to 10 minutes, or until light golden brown. Remove from cookie sheets to cooling racks. Cool completely, about 10 minutes. In small bowl, mix 2 tablespoons of the frosting with yellow food color. Frost star cookies with yellow frosting; sprinkle with yellow sugar. Set aside. In medium bowl, mix remaining frosting with green food color. Spoon frosting into resealable food-storage plastic bag; cut off one corner of bag. 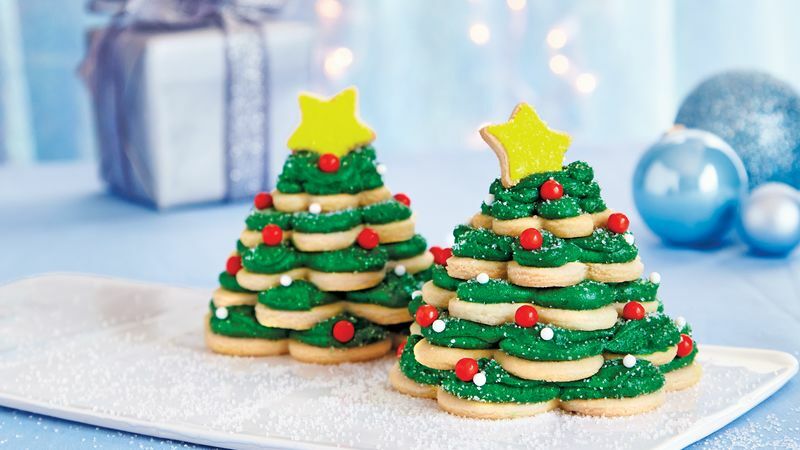 To assemble each tree, pipe green frosting on one large flower cookie; stack with 4 cookies, largest to smallest, piping frosting on each cookie. Sprinkle with coarse sugar. Decorate with candy sprinkles. Top each tree with star cookie.